Ethics in the workplace can work for you in basically two ways. They can either be your best friend or your worst enemy. 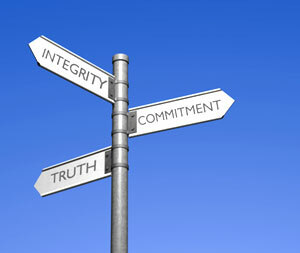 Organizations that have a well defined ethics policy that is followed closely will have better morale. The ones that dont have all kinds of personnel issues and high turnover. You can also forget about trying to motivate employees. So What is a leader to do ? The good news is that you can reverse many bad practices of ethics in the workplace. The bad news is that it's going to take long time. In order to reverse the process leaders need to understand what ethics are. Then determine what unethical issues their own organization have. Ethics is the glue that holds organizations together. Doing the right things the right ways by following policies and procedures. Leaders must understand the differences between moral values and ethical principals. Moral values are what guides our behavior. While Ehtical principals are the ways we are expected to act in the workplace. I have found through my experiences that many employees have the same complaints about ethics. Most of the complaints are of the personal conduct nature. So how does a leader learn how their employees feel. They learn how to be strong at communication in the workplace. The list below gives you seven examples of unethical practices by employees and leaders. The above examples are the ones that were mentioned the most over time. The example above that worries me the most is the leaders who sweep problems under the rug. Leaders with poor ethical behavior in the workplace will have difficulties solving problems and achieving results. The ability to develope employees with high levels of production will not be possible. Employees simply will not listen to you. Would you listen to someone who dosen't practice what they preached ? If unethical practices continue without being addressed they will create conflicts in the workplace. Improper ethics in your organization will have a negative effect on employee motivation. But the affects of workplace conflicts will be the kiss of death to workplace motivation. Handle ethics and other issues by reading this article on managing conflcits in the workplace. High levels of stress can also lead to unethical actions and conflicts, read this article on why stress management in the workplace is important. 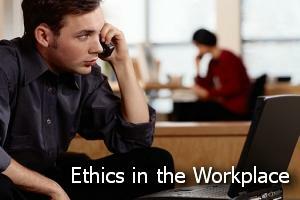 There was already an outcry from employees for improvements in workplace behavior ethics. The way organizations were managing ethics in the workplace was starting to change. At the same time many financial instutuions started to get in trouble and some went bankrupt. In order to avoid an econonmic collaspe the U.S. government got invloved. The government then decided to bailout many organizations. The original design was to keep these financial instutions from failing. Here is were everything changed. Instead of using the bailout funds as protection from going bankrupt. They decided to payout huge bounses to high ranking company executives. Public outrage was unmatched and demand answers. The public backlash changed the views of ethics forever. Many people now view ethcis as not procedures, but as way to live life. Organizations need to take notice and follow along. For any organization to have strong ethics they must understand the key points. The points below must be part of any ethics policy and procedures. You will then be on your way to building an ethical workplace. Detailed and well defined in the form of a manual. Provide trainning for new and current employees. Use ethic policy for guidance. Ability to learn form mistakes. Having a general understanding of ethics in the workplace will point you in the right direction. Leaders will benifit form understanding how their employees feel about ethics. Employee Motivation will be easier. The ability to correct ethical issues will come in time. The key here is that it all starts with you. So walk the walk and talk the talk. Lead by example and you will succeed. Just one tip, idea or sugestion could make all the difference. Stay in the now and never miss a new article. Free E-book "Make Your Knowledge Sell" when you subsrcibe.